Every year, a minor amount new chemical substances are confirmed by Ministry of Health, Labor and Welfare, Ministry of the Environment, and Ministry of Economy, Trade and Industry. In April 2010, our own Yamanashi plant acquired GMP certification which is the standard of manufacturing and quality control. Germanium is an intermediate substance between metal and nonmetal with the element symbol "Ge", atomic number "32". Organic germanium (Ge-132P) is the compound that science synthesizes this inorganic germanium and produces. Germanium can be roughly divided into the following three types. It is mainly contained in minerals and soil. It is used as a raw material for industrial use as diode, transistor, optical fiber and PET bottle's condensation polymerization catalyst, as well as bracelet and necklace. Germanium dioxide is inorganic germanium. Inorganic germanium should not be taken orally. If ingesting inorganic germanium, it accumulates in the body, and kidneys and others are damaged. It is a chemically synthesized inorganic germanium contained in minerals. It can’t be taken except for those with a purity of 100%. 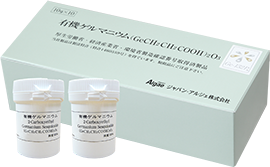 ※Japan Algae's organic germanium (Ge-132P) is synthetic organic germanium with a purity of 100% obtained manufacturing method patent. Organic germanium is characterized by being easily soluble in water. (On the other hand, inorganic germanium is hardly soluble in water.) It is easy to dissolve in water and absorption is smooth, so you can utilize organic germanium efficiently. In addition, it is excreted promptly in about 48 hours, so there is no harm of accumulation in the body like inorganic germanium. Organic germanium exists widely also in wild and natural world. Reishi mushroom, Garlic, Shiitake mushroom, Korean ginseng, Aloe etc. are also included in plants which are said to be good for the body. Known that organic germanium is also contained in water in the "Lourdes fountain" in the Lourdes region of southern France, "Yamabuki water" in Aomori prefecture, and "Anantan no reisui" in Toyama prefecture in Japan. Confirmed to be useful for health promotion by using it as health food. Confirmed that it is useful for skin health by using it as a cosmetic or bath agent. Used in germanium hot bath facilities. Used as battery reinforced liquid. It has been confirmed that it does not show any toxicity in various tests such as acute toxicity, subacute / chronic toxicity, reproductive developmental toxicity, reproduction, antigenicity, mutagenicity (chromosomal abnormality). ※Since inorganic germanium remains in the kidney tissue, it must not be ingested absolutely. For maintaining your health, please take 0.3 to 0.5 g / day dissolving in water etc. It is fine even if you adjust the amount according to your health condition. Copyright(C) JAPAN ALGAE Co.,Ltd. All Rights Reserved.